In his 82-minute state of the union address on Tuesday, U.S. President Donald Trump ping-ponged between a hard line and a soft touch as he talked about everything from foreign affairs and illegal immigration to economic growth and women in the workforce. Trump’s address before a joint session of Congress tried to both whip up his base with familiar promises and reach out to his newly empowered opponents with pledges of compromise. It’s hard to imagine he can achieve both, particularly as the deeply partisan battle over the border heats up again. The vision Trump laid out suggests Americans can expect more uncertainty and division — with a few potential bright spots. Here’s a look at some key points from Tuesday’s address. A big chunk of Trump’s speech was devoted to immigration and border security, with the president calling the situation on the southern border an urgent national crisis. He described MS-13 gang members streaming into the U.S., human traffickers selling women and girls, and smugglers using children as pawns to get into the country. And once again, he made an appeal for a border wall. “Walls work, and walls save lives.” he said. WATCH | Trump talks about illegal immigration and border security. Trump has made all these points — many of them disputed and even discredited — before. But what’s urgent now is the deadline he’s facing. If a bipartisan committee does not reach a border security funding agreement by Feb. 15 there will be another partial government shutdown. To avoid that Trump could declare a national emergency, and divert the $5.7 billion US he wants for a wall on the southern border from defence budgets. 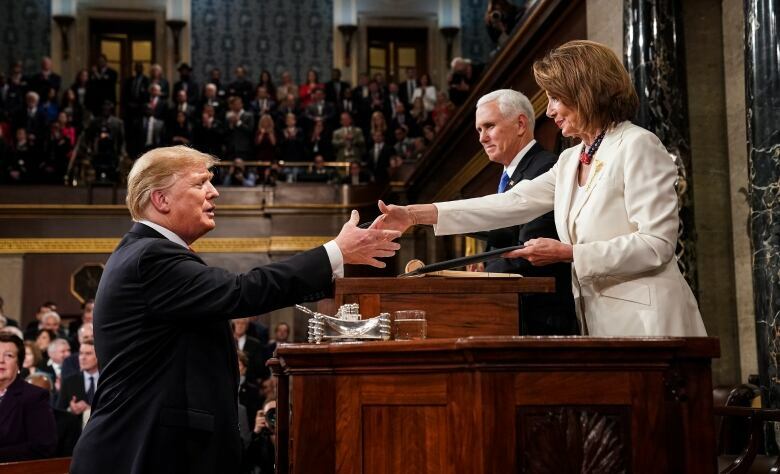 This state of the union laid the groundwork for just that scenario, says Donna Hoffman, a professor of political science at the University of Northern Iowa. “It did certainly seem to me that he walked up to the line of making this a national emergency,” she said after Trump’s speech. But there is strong opposition from inside Trump’s own party for an emergency declaration, which would be challenged in court. Republicans worry it would set a precedent future Democratic presidents could use for their own exaggerated emergencies. The president said the wall “will be deployed in the area’s identified as having the greatest need” — suggesting he might sign off on a wall that did not run the length of the entire border. Trump’s stark language on abortion on Tuesday shows that the long-running debate is only going to get more intense ahead of the 2020 presidential election. Many evangelical Christians who helped elect Trump did so, at least in part, to get a Supreme Court that would overturn Roe vs. Wade, a decades-old federal case affirming the legal right to an abortion. “Let us work together to build a culture that cherishes innocent life.” Trump said. The president, who said he would push Congress to pass legislation banning the “late-term abortion of children,” specifically took aim at New York, saying recent legislation there “would allow a baby to be ripped from the womb moments before birth.” New York’s recently passed Reproductive Health Act tackled a range of issues, including provisions about late-term abortions, access and removing potential criminal penalties for providers. New York Gov. Andrew Cuomo hit back at Trump immediately, issuing a statement Tuesday night saying the president is trying to roll back long-established law. Democratic Virginia Gov. Ralph Northam also came up, though not by name. Mary E. Stuckey, a professor at Pennsylvania State University who is currently writing a book about what she calls “despicable discourse” in American politics said she hasn’t heard a president use that kind of language. Offering bipartisan promises — that just might work? The potential of getting Congress to agree on legislation may not be exactly boundless, but Trump did suggest some starting points. “We all know there’s that potential for Democrats and Republicans to work together on that,” said Hoffman. “But it doesn’t ever seem to get here.” That could change with divided government, partially because the need to fix roads and bridges is increasingly dire. Reducing prescription drug pricing is another Trump pitch that has broad appeal. In fact, Sen. Bernie Sanders introduced a bill in December to just that. The problem with any compromise will be in the details, though, and Trump’s bipartisan pledges were short on specifics. He also talked about including a provision for paid family leave in his budget, another measure that enjoys broad support among Democrats. Trump gave his speech to the most diverse Congress ever — with the largest number of women elected. Many of those women were motivated to run in opposition to a president who has come under fire in the past for his treatment of women. Speaking about the economy, Trump said women have filled 58 per cent of new jobs created in the last year. That prompted cheers from the female freshmen Democrats, who got their jobs by defeating Republicans. “You weren’t supposed to do that,” joked Trump, adding an unscripted congratulations. 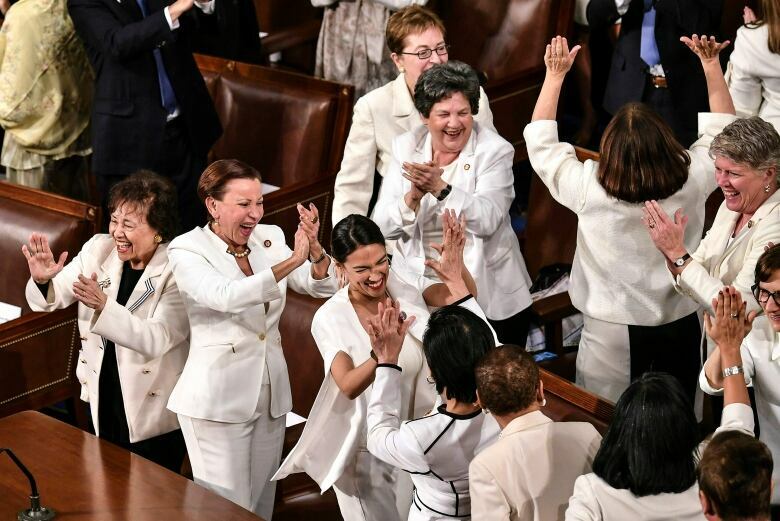 That block of Democratic women seated together, all wearing white in honour of the suffragette movement, was a visual reminder of the recent changes in Congress. 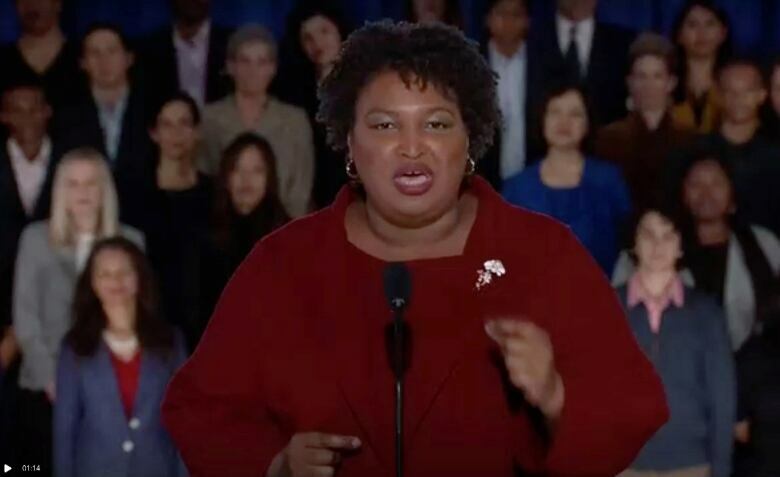 The Democratic response to the state of the union was given by Stacey Abrams, who narrowly lost the Georgia governor’s race to that state’s Republican secretary of state Brian Kemp. Early into her speech from a union hall in Atlanta, Abrams brought up something the president didn’t mention at all: the 35-day government shutdown that postponed the state of the union in the first place. She mentioned student loans, voter suppression,health care and climate change. Not one of those topics came up in the president’s speech, either. The difference between the two speeches shows why bipartisan compromise on anything will be tough. Despite some recent common ground on criminal justice reform, Republicans and Democrats don’t have the same priorities. But what both speeches did, says Hoffman, is highlight the very different visions for America the two parties present, which will matter more and more as the U.S. gears up for a presidential election year in 2020. “You have a really stark choice,” she said.